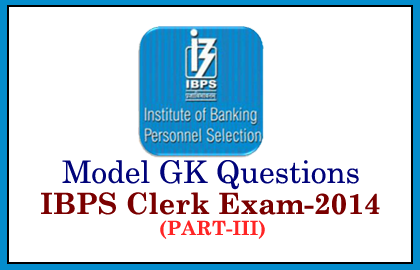 List of Model General Awareness Questions for Upcoming IBPS Clerk Exam 2014 were given below. Candidates those how are preparing for those exams can make use of it. 1).Which Indian-owned brand ranked in the annual list of world’s top 100 brands announced by leading brand consultancy Interbrand? 2).Who won the 2014 Shanghai Master’s Tennis Men’s singles title tournament? 3).What is the name of the first semi-high speed train that was yet to operate soon between Delhi and Agra? 4).Which of the following circumstances will end the relationship between a bank and a customer? 5).Which of the following is a legal clause that gives a lender the authority to seize debtors’ deposits when they default on a loan? 6).Who is the chairman of National Disaster Management Authority (NDMA)? 7).Kailash Satyarthi, who won the Nobel Prize for Peace, is associates with which of the following NGOs in India? 8).Gujarat government has started a Special Purpose Vehicle (SPV) to promote the state’s cultural Capital and to encourage tourism in which city? 9).According to the KYC policy of the RBI, PAN is required if the transaction amount exceeds? 10).What is the minimum number of withdrawal transaction is allowed for the Basic Savings Bank Deposit Accounts (BSBDA)?